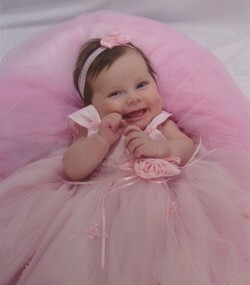 Emma Leigh Barker was born in Lancaster, California on September 2, 2007. It is the only home she ever knew. Emma was taken from this life on March 18, 2009. She was 18 months old. Since the day Emma came into this world she was a ray of sunshine from the Heavens above. Emma had the sweetest personality and she greeted every day with with a huge smile. The first thing everyone noticed about Emma was her smile. She woke with one in the morning and went to sleep with one in the evening. She started smiling when she was just a few weeks old and it lit up her whole face. No doubt she could chase away the grayest day - so bright was her smile. Alvin and the Chipmunks and The Bee Movie. She could only speak a few words but when she spoke she had the voice of an angel. She loved to be outside, at the park her favorite activity was playing on the swings. Emma would point with her little finger at all the new things she wanted to know and learn about. She was just a little shy, but loved making new friends. Emma is survived by her father, Anthony and his family of Long Beach. Her mother Stacey, grandparents Gary and Sue, her uncles Nick, Glen and Matthew, her great-grandparents, great uncles and great aunts. Emma has now joined the angels in Heaven, but she is greatly missed and will always hold a special place in our hearts What Heaven has gained is truly a loss to everyone left behind.